To carry on with life with this many emotions thrown at you at once is beyond challenging and it is usually the smallest things we all do without thinking, like planning a simple meal or popping to the shop, even looking a friend in the eye, that are the hardest to cope with. What we’ve been used to day to day, our duties to our families or responsibilities at work, which we have taken and been taken for granted, are suddenly too much. But we should not feel we have to run from or hide our feelings just so other people are able to carry on with their lives without inconvenience, or to avoid creating upset or an atmosphere. This is death. Cold, terrible death. There is nothing at all pleasant about grief, not even the fond memories can ease the pain of losing a child. The departed need to be mourned, there is no way round it. We need to be given time and space from family, friends and colleagues to get our heads around what has happened, to process the events surrounding the death and work out how we can live ourselves beyond it. ‘Do not stand at my grave and cry, I am not there, I did not die,‘ a seemingly comforting but misleading sentiment. Yes, stand at my grave (which you’ve somehow managed to organise putting there) and cry your bloody heart out for me. Shout, moan, wail, swear or be silent. Let your pain and sense of loss pour out of you in your way. To hold it in will only hurt you more; and it’s a very real, physical pain, a hard gripe deep in your chest and stomach. No, the departed may not be there in spirit, but their body, the body we’ve nurtured, loved, held and kissed, is. So they are there, and they did bloody die. Dead. Never to return. Forever. Comfort does not come from glossing over it. Each of us has our own ideas of what grief should be and can wonder at the reactions of others. The death of a child is naturally one of the hardest to bear for the parents, but who are we to judge if a person crumples when their dear grandma passes away at the ripe old age of 97? Sometimes death is expected and even welcomed, but that doesn’t make the reaction to loss any less important. In fact, the death itself isn’t really the significant factor here, it’s the grief that is felt after and how that is allowed to be expressed. Death happens to us all of course and, understandably, no one likes to dwell on that for long. Life is most definitely for living. But it’s still a hugely significant stage in our lives which instantly overrides all the crap we all have to deal with on a daily basis. It forces us to take a step back to see the fragility of life for what it is and not the mindless humdrum (though it is that humdrum, I’ve realised, that helps keep us sane in the long term). As I’m now heavily pregnant, I have considered how we [society that is] give so much attention to the birth of a baby; people love new life and are happy to share the joy. Indeed, I’ve received much love from people who are so happy that we have something positive to look forward to after our terrible time. In this country, it’s normal for us to take lots of time off work to help ourselves adjust to the new baby and focus on it in its early months – we’re understandably tired and need to recover. People visit with gifts, offers of help, warm wishes. We look after ourselves, don’t overload, put our feet up more. I’ve received lots of cards addressed to us all, some including ‘the bump’, as people naturally share in the joyful anticipation of the new arrival. So, from birth to death. Grief becomes ‘the new baby’. By contrast, after a death, we feel urged and under some pressure to get back to normality as quickly as possible, though this pressure is often internal – because other people are getting on with things, we feel we should too, and we crave normality. Often, no long-term plan is put in place to cover for you, like with Maternity Leave for example, perhaps a few days or possibly weeks at most (‘How long will you be needing off anyway?’). [It’s also part of the reason I signed the Bereavement Leave petition, which campaigns for better leave rights for bereaved parents.] After all, we are not ill ourselves, we’re just ‘upset’ at the moment, right? Surely we need the distraction of work, it’ll help ‘take our mind of it’. Perhaps it will, but what if it doesn’t and a few months or years down the line it really hits us? And then people don’t talk about it for fear of upsetting you or saying the wrong thing, some simply avoid you altogether. Often the bereaved don’t want to talk about it, so even if we’re asked, we simply say, ‘Oh, I’m okay.’ We have to go at our pace and don’t want to pour out to everyone we meet. Everything becomes a bit awkward. And, of course, we can’t look after ourselves. We can’t eat properly (not just because our appetite has changed from nausea to comfort eating, but because, temporarily, we have no idea now how to prepare and plan meals). We ache all over. Are anxious. If we had flu, we’d hit that bed so fast, turn the phone off and stay under the covers for a week. That’s a legitimate reason to be out of action, right? But no matter how often I’ve felt it, I haven’t hidden under the covers… partly due to my fear of going there and never coming out, mostly simply because my other children need me… but perhaps some time to just ‘be’, be with my thoughts, think of no one else for a while, is what I need? Oh, but ‘in time’… Time is a healer, isn’t it? No, not really. Time let’s us know that life is still there for us, if we want it. 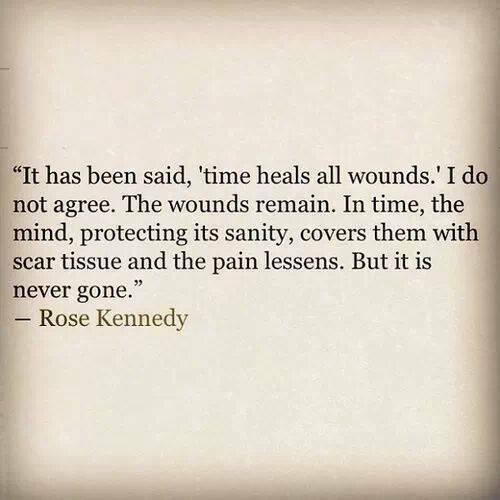 It lets the wounds of grief scar over, a scar that we need to feel in order to keep close to that person. With time, we still need grief, it just changes from being all-consuming to being a part of the life we’ve found ourselves living ever since. I recall seeing an interview with the lovely Mary Berry, now in her eighties, who lost her son when he was 19, despite her professional attitude and composed demenour, even after all these years she still wells up quickly when asked about her son. The scar of his loss all too quickly opens up. I could see that that was what life would be for me now. I was offered a reiki healing session recently by a well-meaning acquaintance. A thoughtful gesture I don’t deny, but I don’t really understand reiki; in any case, I balked at the thought of being healed. Much as I want this constant pain, confusion and emotional instability to go, it’s all I have now. I need it to feel I’m still being her mother, feeling her loss, doing something for her by at least grieving. I’m not sick. I don’t need a cure or a pill. The only cure I’ll have is when I’m finally with her again. I don’t really know what point I’m trying to make here, but reading back it’s clear that grief is one big rambling mess that none of us can fully understand or predict. It’s an endless, lonely emotional rollercoaster; how can any two people truly share the exact same terrible ride? All I can do is pray. Pray for peace in my heart and the strength to live and love the life I have day by day. This entry was posted in Life with grief, Living and grieving, Remembering Abigail, Special days and occasions and tagged bereavement leave, bereavement leave petition, brain haemorrhage, child bereavement, Emotion, grief, Grief Loss and Bereavement, Pregnancy after loss by Chasing Dragonflies. Bookmark the permalink. Hi there, just came across your blog and wanted to thank you for signing my bereavement leave petition.